Wow. 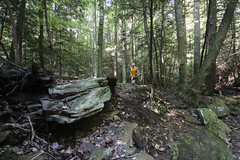 When you signed up for the 2013 Rock/Creek StumpJump 50k, being that it takes place the first week of October, were you expecting a high temperature of 87 degrees? What about an average humidity of 73%? What about nests of angry yellow jackets? Neither did we. We finally got the “hot year” we’ve all dreaded. That oppressive heat and humidity — along with all those yellow jackets! — took a major toll on this year’s race field, with over 100 DNFs. Despite 587 sign-ups, only 448 racers dared toe the starting line on race day, and 343 of those were able to bring it home. It seems like everyone has their own war stories from this year, and you all seriously earned those finisher’s medals. The men’s 50k was swept by three guys who live really far away, including race winner Robert Pritchett. Robert made a pass for the lead with about 3 miles left in the race and never looked back. 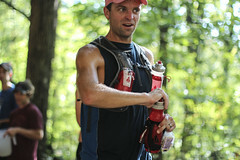 Salomon athlete Eric Bohn — who led much of the day — finished second, followed by Brandon Sullivan. Great showing for Sullivan, back with a score to settle after going off-course with a pack of lead runners in last year’s race. In the women’s race, Salomon athlete Gina Lucrezi also led the first half of the race, but twisted an ankle badly in the Mullens Cove loop and showed great courage in toughing out a 3rd place finish. Erin McMahon from Boulder, CO took the big win, with Erin Hannen finishing second. 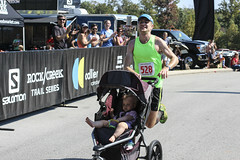 The 11-mile podiums were full of local studs and Rock/Creek Race Team runners. Congrats to Tim Tatarka and Elizabeth Callaway for their overall wins in a very competitive race! There’s also a great article in yesterday’s Chattanooga Times-Free Press; reporter Ron Bush interviewed many top finishers and there are some excellent quotes in here. 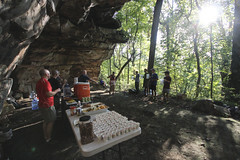 Please support Rock/Creek, title sponsor Salomon and our many other incredible race sponsors: SmartWool, The North Face, Marmot, Patagonia, Collier Construction, Get Out Chattanooga, Toyota of Cleveland and Capitol Toyota, Whole Foods, Outdoor Research, High Point Climbing & Fitness, Hammer Nutrition, Trail Runner Magazine, Orion Sports Timing and RiverRocks Chattanooga. The next race in the Salomon Rock/Creek Trail Series is the cult-classic Upchuck 50k, followed by our popular Lookout Mountain 50-miler & 10k in December. We hope to see you there! 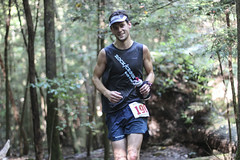 Rock/Creek Race Team member John Brower on a pair of 100-milers.